NYC's Residential Bosses - Stephen P. Wald Real Estate Associates Inc. In addition, a number of firms saw sales volume tank. And, transactions fell in every quarter of 2018 as buyers hesitated in the face of the new tax laws, rising interest rates, economic and political instability and expectations that prices might continue to decrease. As The Real Deal has exhaustively chronicled, brokerages were being squeezed from every direction in 2018 as tech disruptors made inroads, agents demanded higher commission splits, rivals aggressively poached talent and the market failed to cooperate. It was also the year that Town Residential closed its doors and brokerages were generally scrambling to recalibrate to keep up. The general atmosphere was like “a wet blanket laying over the market,” said Jonathan Miller, CEO of appraisal firm Miller Samuel and author of Elliman’s quarterly market reports. This month, with that wet blanket in mind, TRD brings you its annual ranking of Manhattan’s top firms by closed sell-side sales. Elliman, usually the number No. 2 finisher, overtook the Corcoran Group to land the No. 1 spot on the ranking. To be precise, its dollar volume of closed Manhattan deals soared by nearly 72 percent to a massive $8.99 billion. However, he acknowledged that most of those closings involved “legacy contracts” inked before 2018. Corcoran, which took the No. 2 spot, saw its closed sales sink by 28 percent to $4.53 billion, down from $6.29 billion last year. Rounding out the top five were Compass with $2.01 billion in closed deals (up nearly 47 percent), Brown Harris Stevens with $1.8 billion (up nearly 69 percent) and Stribling & Associates with $1.62 billion (up nearly 3 percent). The rest of the top 10 included Sotheby’s International Realty ($1.24 billion), Halstead ($997.8 million), Warburg Realty ($578.5 million), CORE ($448.7 million) and Nest Seekers ($346.3 million). Together, the top 25 firms closed $24.1 billion worth of sell-side deals in Manhattan, according to TRD’s analysis. That’s 13.6 percent higher than the previous year’s $21.21 billion. To determine those numbers, TRD pulled thousands of Manhattan listings from real estate data firm LavaMap and then cross-referenced them with closed sales in public records. Firms were also given the chance to submit deals. Brokerage heads said that despite the faltering market of 2018, the worst is probably over — a view that seems to be supported by the numbers. Sales declines have actually been decreasing by the quarter, according to Miller. And Jed Garfield, president of the townhouse-focused boutique firm Leslie J. Garfield, said he didn’t think the market would be “great” this year, but predicted that it would likely be better than 2018. “But only because it can’t be much worse,” said Garfield, whose firm ranked No. 13 with $172.5 million in closed sell-side deals. She also acknowledged that Elliman had a “terrific year” in 2018 but predicted that 2019 would be a “big one” for Corcoran. And she may be right. Last month, the firm closed a record-breaking sale for Vornado Realty Trust at 220 Central Park South when billionaire hedge funder Ken Griffin paid a stunning $238 million for a penthouse — the most expensive home ever sold in the U.S.
And there are likely to be more where that came from: the company’s new development arm, the Corcoran Sunshine Marketing Group, is representing some of the highest-profile and priciest new condos the city. In 2018, Elliman’s deals included the year’s priciest sale — a $73.8 million penthouse at Zeckendorf Development’s 520 Park Avenue, to vacuum-cleaner mogul James Dyson. The firm’s Noble Black Team closed that deal in November. And the same month, Elliman’s Nematnejad Scheinman Team closed on a $62 million unit in the same building to billionaire investment banker Ken Moelis, though that deal, like many others, closed at a significant discount off the original asking price. In addition, the brokerage closed five units at 432 Park Avenue totaling around $162.5 million. 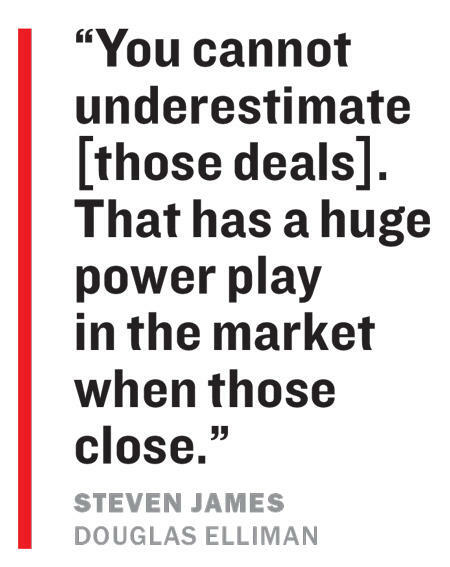 James said the firm also did a high volume of midpriced deals. “We have almost 2,000 agents, and they’re not sitting idle or they wouldn’t have a desk,” he said. 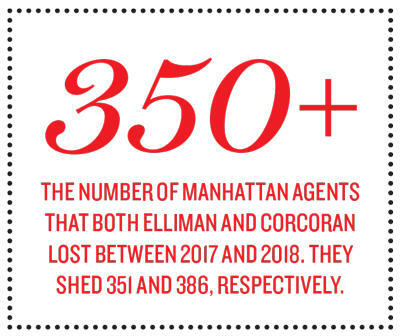 To that end, however, both Elliman and Corcoran lost a colossal number of Manhattan agents between 2017 and 2018 — shedding 351 and 386, respectively, according to TRD’s analysis. (By comparison, Compass picked up 159 agents). Outside of the other abovementioned brokerages, showings were mixed when it came to closed sales. Sotheby’s volume was down about 8 percent over 2017, while Halstead saw its dollar volume drop by nearly 19 percent. Yet Warburg saw its dollar volume jump by about 185 percent — more than any other firm on the ranking — and Nest Seekers, which is anchored by “Million Dollar Listing New York” star Ryan Serhant’s megateam, logged a nearly 96 percent jump. CORE, meanwhile, saw a 29 percent increase despite losing 62 agents (a number of whom jumped to Compass). But while several firms made sizable gains in 2018, some sources said that the real test will come when 2019’s numbers are tallied, because those figures will more accurately reflect 2018’s slowdown. As a result, he said, sales volume, transaction volume and average sale price would all “drastically decrease” in 2019. Peters compared the situation to the wealth management industry. Where once wealth management was handled by a single agent, the industry has been heavily disrupted by tech over the last decade. Today, anyone can invest using an app without ever dealing with a professional advisor. Nonetheless, there is still a booming private wealth management business at the high end, consulting for very wealthy clients who still choose to use more traditional services. “The question for us in a place like New York City, certainly for brokerage owners, is: ‘How do we become like the private wealth managers?’” Peters said. Elizabeth Ann Stribling-Kivlan, president of Stribling, also didn’t mince words. “On a global scale, people are working hard to push the agent and the brokerage out,” she said. The answer seems to be doing anything and everything possible — from rebranding to acquiring rivals to entering new markets. Corcoran, for example, is planning a massive expansion that would franchise the brand to “global megacities” and leisure markets, starting with Miami. The goal is to launch in six to 10 new markets within 18 months, Liebman told TRD in October. And there is a level of urgency: The market value of Realogy — parent company to Corcoran, Sotheby’s, Citi Habitats and a string of other firms — was $2.79 billion lower last month than it was in January 2016, according to the financial website YCharts. Elliman is abandoning the multimillion-dollar “It’s Time for Elliman” branding campaign that it launched in 2017 and has hired a creative director along with the ad agency Grey New York to embark on a new rebranding. Compass — valued at $4.4 billion after raising $400 million in Series F funding from Soft Bank’s Vision Fund and the Qatar Investment Authority — has gone on a well-documented national acquisition spree. (The firm has, however, said it would scale back on buying firms in 2019). Bess Freedman, BHS’ newly named CEO, said her firm has spent millions of dollars on a proprietary listings system called Resource, developed by Eric Gordon, the founder of listings system RealPlus. The firm also uses expensive research tools like Instant Value, built by the Vanderbilt Appraisal Company. “We’re investing heavily in anything technology-related,” Freedman said. But many of New York’s established firms are scrambling to keep up with startups that launched with tech baked into their models. In December, for example, Compass announced the launch of a tech campus in Seattle that will employ 100 engineers to work on marketing technology, web and mobile services, security and artificial intelligence, among other things. The company also brought on machine-learning and AI expert Joseph Sirosh, who previously worked at Microsoft and Amazon. And it’s not just Compass giving firms a run for their money. “The bigger firms just can’t move as quickly,” said Jordan Sachs, CEO and co-founder of Bold New York, which launched in 2010 after the financial crisis and is now representing a slew of new developments including HFZ Capital’s Oskar in Hell’s Kitchen and JDS Development’s American Copper Buildings in Murray Hill, both luxury rentals. “We didn’t feel the squeeze on the technology side as much as other firms did,” he said. “Now they’re catching up to the rest of the industry,” said Murray, who has worked with a number of firms in the city. John Campbell, an analyst at the Stephens financial services firm, said three years ago Realogy’s average split was 68 percent. Now it’s closer to 73 percent. The figures may be higher at the individual firms owned by Realogy. Among the private firms, some are public about their splits while others, like Compass, are not. BHS, for example, gives agents 75 percent splits when they gross over $670,000, according to Freedman. He said agents should consider what resources they get from a brokerage beyond a high split — like marketing, IT, public relations and transportation. Last year, a number of agents were considering all of those things and a host of others. The year saw a rash of big broker moves — many of which were prompted by Town’s closure, which sent nearly 400 agents scrambling for new homes. The usual suspects — Compass, Corcoran, Halstead, Elliman — picked up dozens of Town agents and executives. For example, Jeff Appel, Town’s former president, jumped to Halstead; “Million Dollar Listing New York” star Steve Gold landed at Corcoran, as did Danny Davis and Dana Power. Outside of Town’s collapse, one of Corcoran’s top brokers, Vickey Barron, jumped to Compass, and BHS’ Erin Boisson Aries decamped for Christie’s International Real Estate to help launch its brokerage division. Freedman said her agents are receiving daily text messages and calls from other firms, most notably Corcoran and Compass. Both Compass and Corcoran disputed that categorization of their recruiting efforts. “Agents that come over to the company are given a small incentive to aid their transition,” said Rory Golod, Compass’ New York general manager, claiming agents were not offered $70,000-plus signing bonuses or 100 percent splits, as some sources suggested. Either way, some heads of firms are balking at the prospect of increasing commissions too much. “We’re going down a road right now to where the demand from the broker is getting higher and higher, meaning, I want 80 percent commission splits. I want a marketing budget. I want an assistant, whatever it may be,” he said. In the first weeks of 2019, news leaked that Sotheby’s was planning to move from East 61st Street into a larger office at 650 Madison Avenue. “We’ve outgrown our space,” President and CEO Kathy Korte told TRD, explaining that she thinks the new space will drive business. CORE, meanwhile, is closing its office at 127 Seventh Avenue but has plans to open in West Chelsea near Hudson Yards. The firm hasn’t finalized its new location, but said it decided three years ago to relocate when its lease expired. The new office will give clients a more tech-based experience, the firm said. Warburg’s Peters said firms should be favoring investment in tools or tech over physical space. But despite shrinking profit margins, many firms seem to believe that investing in tech is not enough to produce more deals and, in turn, more money for their firms. As a result, recruitment and expansion are both in full swing. Adam Modlin, founder and CEO of the Modlin Group — which ranked No. 15 with $127 million in closed sell-side Manhattan sales (up nearly 53 percent from 2017) — said he plans to recruit and hire a new team for his boutique brokerage in 2019. He said his ultra-high-net worth clients aren’t as affected by the unstable market. Many are also focusing on expanding even deeper into the outer boroughs. Elliman’s James pointed to opportunities in sometimes-overlooked neighborhoods like Sunset Park and Ditmas Park. Amazon’s pending arrival in Long Island City is also opening up that already active neighborhood. And Ramirez noted that in Brooklyn, Halstead now has an office in Bay Ridge and two in Bedford-Stuyvesant. But she said the calculus for expansion is different than it once was. “You’re going to look at the space differently than you would have five years or certainly 10 years ago,” she said. For its part, BHS opened one office in Park Slope in 2018, as well as one apiece in the Hamptons and Palm Beach, Florida. But Freedman, too, said the firm thinks carefully these days about where and when to expand and about how to invest dollars and cents. Corrections: An earlier version of this story undercounted Brown Harris Stevens’ total number of deals and total dollar volume. The firm’s percent change over 2017 was also fixed. The company closed 704 sell-side Manhattan deals valued at $1.81 billion in 2018. That was 68.59 percent higher than its 2017 totals. The numbers are wrong in the print issue. In addition, an earlier version of the story incorrectly referred to Clelia Warburg Peters as Clelia Warburg.